I felt really crummy all week. I thought that work was just getting to me. It didn't help that a former student, now age 16, was shot and killed while walking down a street on Chicago's West Side Wednesday night. We read about black men being murdered all the time and it's always sad, but it's an extra punch in the gut when you know the victim. He was bright and his future was promising. He was playing football and hoping for a college scholarship. My heart goes out to his mother and the rest of his family. Partway through the day Friday, I realized that I had a sinus headache. It was kind of a relief to realize that was why I was so tired and achy. Since I got home yesterday, I've been steaming my sinuses, resting, drinking gallons of herbal tea. 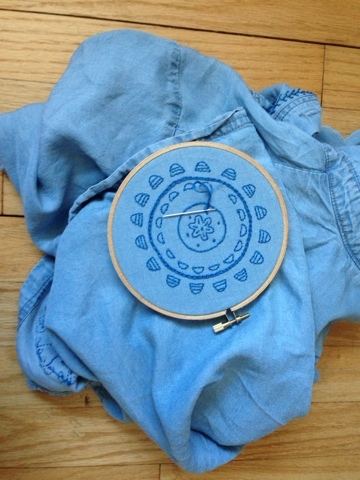 And embroidering. For some reason, that is the needlework that has been calling to me between naps. This is a summery shirt that I'm embellishing. I start by penciling in some basic lines using a commercial stencil. And then I just kind of doodle from there. At least I feel like I'm getting something done! 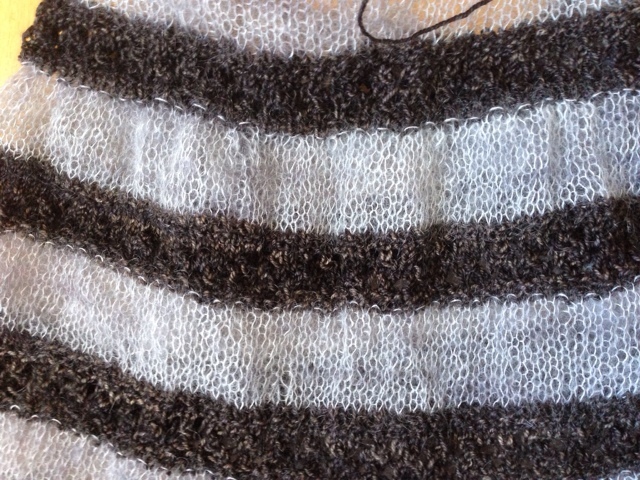 Monogamous knitting does not make for interesting blogging, so I thought I'd show you a picture of project that you haven't seen for a while, my Pelerine Shawl. I keep it by the couch and use it as my TV knitting. We don't watch much TV, so this is going to take a while. 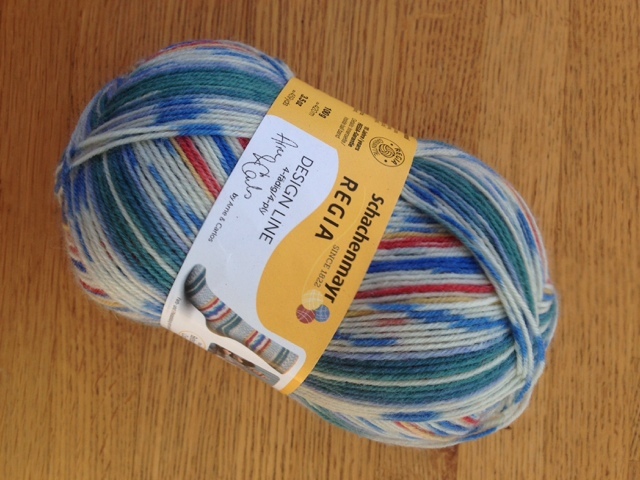 But it has to be done by July 1 because I'm going to Meg Swansen's Knitting Camp! I was only going to go for one year, but my friend Marsha really wants to go together -- and so we are. Show and Tell is a big event at camp, and it's always fun when people model their EZ patterns. 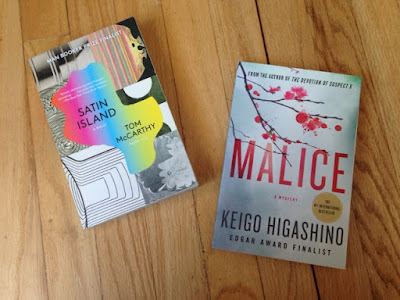 I finished reading Malice, and I recommend it for anyone who likes puzzle-like mysteries. 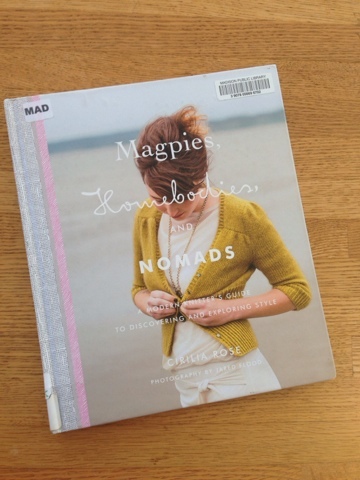 I haven't settled into a new book yet, but I did stumble on a beautiful knitting book on the New Books shelf at the library: Magpies, Homebodies, and Nomads by Cirilia Rose. First, let me say that Jared Flood did the photography, so you know it's gorgeous. It's not a book for novices, which is nice. Instead of lots of knitting 101 text, there are interesting essays like "I Am, As I Suspect Many of You Are, Addicted to Yarn." The patterns, in my opinion, run the gamut from drop-dead gorgeous to would anyone really wear this? For example, the Tisane Tank is, well, odd. My favorite pattern is the L'Arbre Hat and Mitts. It is beautiful and practical. And I'm trying to knit things that I'll wear -- not just things that are fun to make. 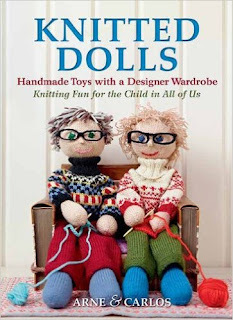 And I love the Isla Cardigan, which is featured on the cover. I'll be checking in with Ginny's Yarn Along. Hope to see you there. 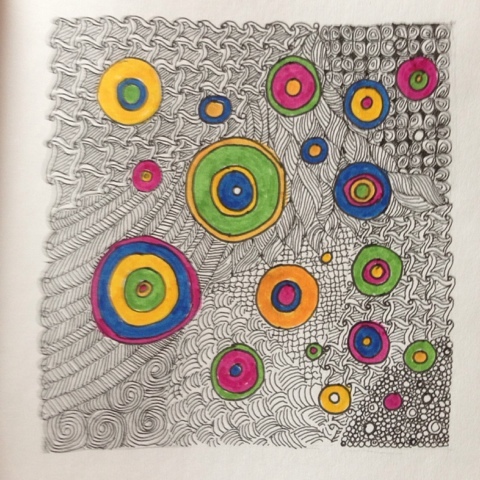 I fell in love with Zentangle from the minutes I first saw it, and I still do quite of bit of it. It is very relaxing. First up is a shmooshy skein of Miss Babbs Yowza. I have to point out that I didn't pay retail for this one; nope, I shopped stashes on Ravelry and saved a few bucks by ordering from a Raveler. I do try to only buy yarn that is intended for a specific project. This is going become a Brickless, a pattern that I learned about from a friend a few weeks ago at the Sun Valley retreat. 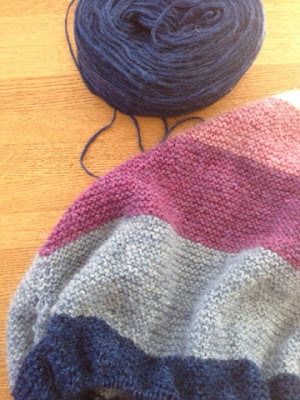 I think it was designed for this yarn, as the pattern calls for 560 yards -- the exact amount in Yowza! I expect to start this one pretty soon. Do you know Arne and Carlos? They are a Norway-based couple, both personally and in business, who design all sorts of things, including knitwear. 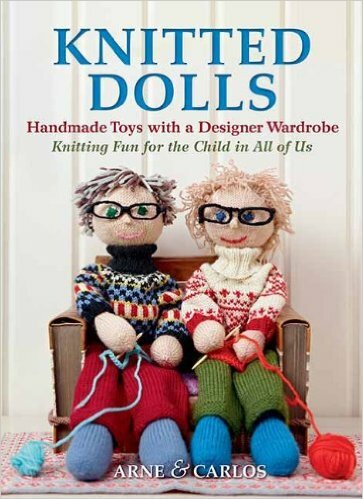 I own their book on knitted dolls and I will (I swear) actually use it one of these days. I know what this will become: socks! (Duh.) It may be a while before I get it on the needles, but that's OK. It will get used! BTW, there's a reason that heroin was on my mind; last night, Keith and I watched a documentary on Amy Winehouse on Netflix. Such an amazing musician; such a sad person. A tortured soul. I used to think her song about refusing to go to rehab was funny. It doesn't seem so funny now. Have you "enhanced" your stash lately? I really should be working on a couple of pairs of socks, both of which are gifts, but I can't seem to stop knitting rounds on my Winter Ridge Poncho. I am getting close to the final stage -- the neck -- so it's hard to slow down. I'm knitting this as a KAL with my knitting pal, Marsha, and she has finished hers because she wants to take it with her on a cruise later this week. She modeled it for me yesterday and she looked darling in it. 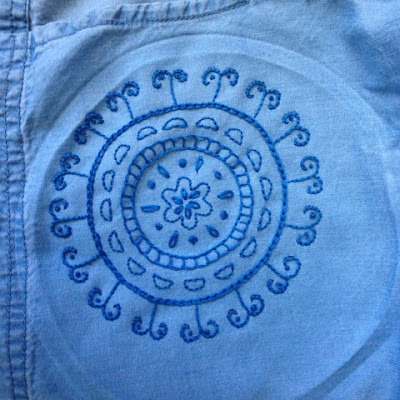 It will be perfect for cool days on deck. And the best part is that Ewetopia has kits available on their web site again -- just use the link above. I finished Satin Island, and I liked it but it's not for everyone. Even though it's a novel, it reads almost like nonfiction. It's filled with all kinds of thought-provoking passages like this from the first page: "People need foundation myths, some imprint of year zero, a bolt that secures the scaffolding that in turn holds fast the entire architecture of reality ..." Definitely a demanding read. The plot kind of falls apart in the last quarter of the book, but I finished it anyway. The narrator is a corporate archaeologist who is supposed to capture the narrative of the large company he works for. Honestly, I'm not even sure if he accomplished that task. Like I said, it's interesting, but it's not for everyone. As an antidote to all that thinking, I picked up Malice by Keigo Higashino, a mystery from Japan. I'm about 50 pages into it and I look forward to picking it up each night. It's told from various viewpoints -- and I love that approach. It is definitely a nice change! 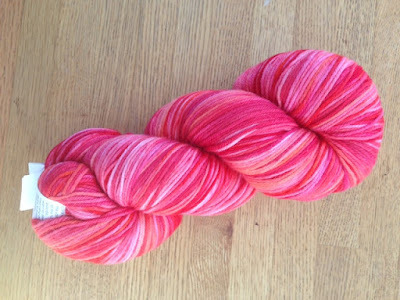 I'll be linking up with Ginny to Yarn Along. Adah is the daughter of one of my cousins, and she is just a lovely young woman. She is clearly very, very bright -- but also sweet and modest. I got to spend time with my favorite cousins, as well as to see my brothers. Even my parents flew out, which is a big deal as my father is 83 and quite frail. I absolutely fell in love with the city. What a beautiful place. 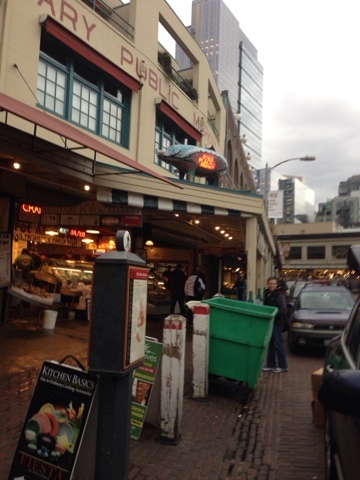 Every restaurant we went to -- Wild Ginger, Top Pot Donuts, Serious Pie -- was amazing. Although, I was disappointed that the "pie" in Serious Pie referred to pizza. Still, it was good pizza. 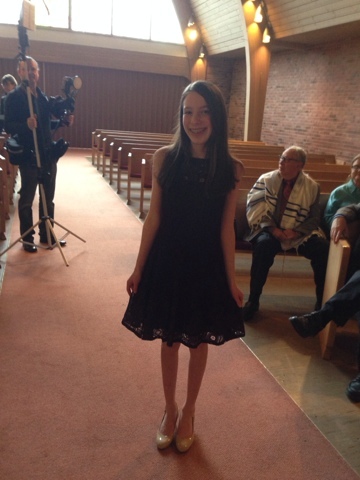 The Bat Mitzvah was held in Alki Beach, which is a beautiful neighborhood. I wanted to send for my belongings and move in. 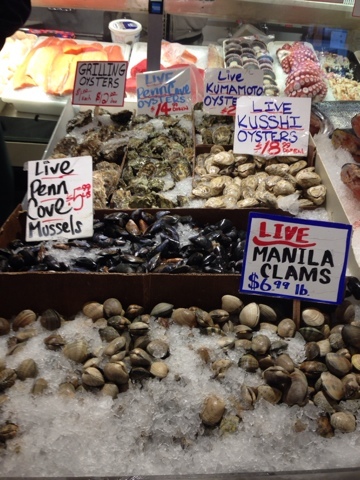 I often feel this way when I travel: I want to experience living in these different places. Am I the only one? 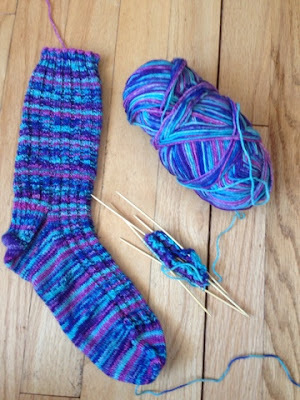 It turns out that Adah would like blue hand-knit socks for her Bat Mitzvah, so I know what will be going on these needles as soon as this pair is finished. 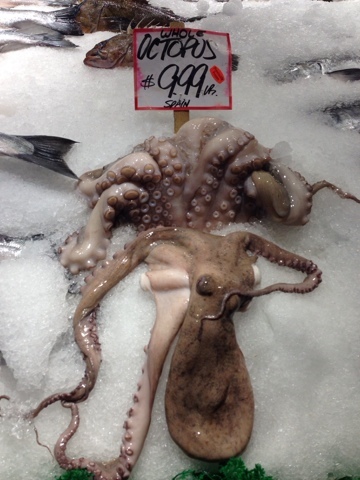 Anyway, I am hoping to visit Seattle for a longer stay this summer. I knew I wouldn't have time to see friends on this last visit (thinking of you, Judy), but I hope to meet up this summer. I'll keep you posted as the plans emerge. 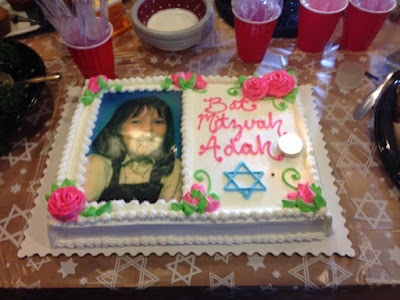 If you read this blog even semi-regularly, you know that it's been a tough school year for me. And I know I'm not special; there are lots of articles out there about teachers struggling and leaving the field. But things have let up a bit on me (outside of the paperwork! ), and I'm enjoying some breathing room. And even having fun. I started my annual Black History Month unit on roots music today, and my students loved learning about Robert Johnson. Usually, they are not impressed by the scratchy recordings of this iconic bluesman, but this morning my students listened raptly. And I'm happy with my knitting. 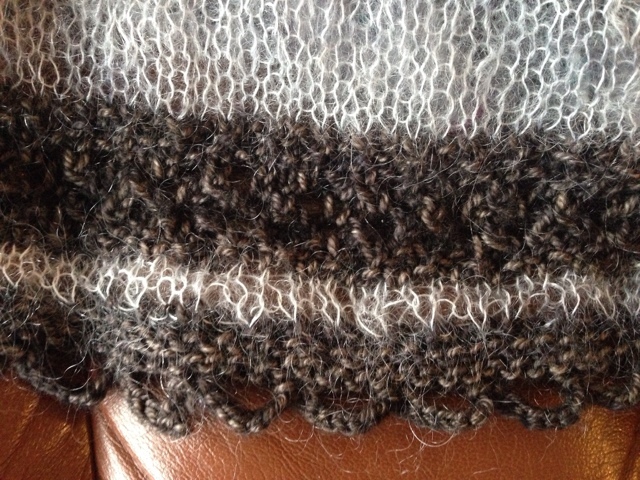 The Winter Ridge Poncho is coming along nicely. As promised, I took a photo to show the edging at the bottom, where you start. 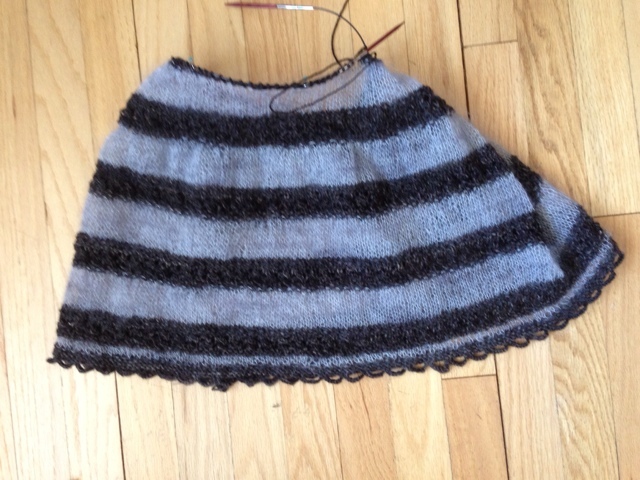 I had to cast on 488 stitches and figure out how to cast-off without knitting, but it was totally worth it. There is a lot of stockinette in this project, so I caught up on Downton Abbey Sunday night. I am loving it even though I suspect it going to have a ridiculously happy ending. I am the lucky winner of Bridget's giveaway. 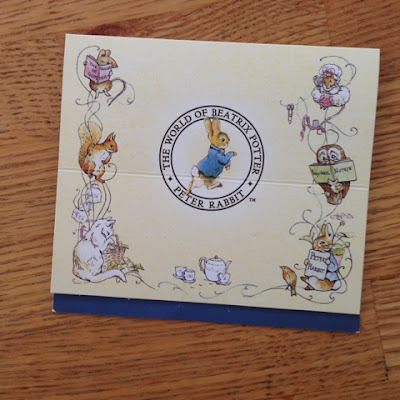 I cannot send enough gratitude to Bridget, who blogs at The Ravelld Sleeve. 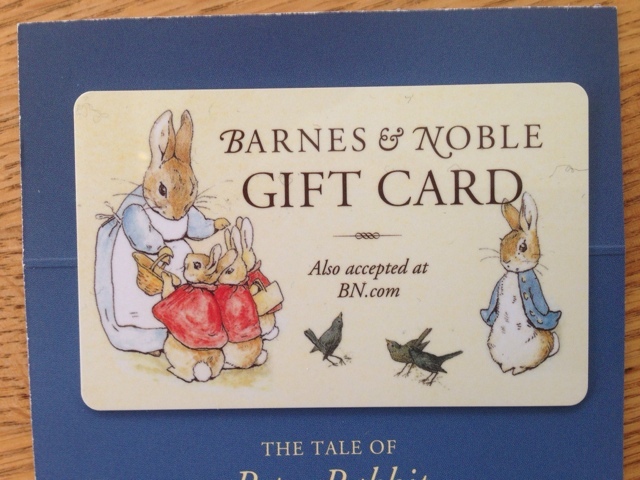 There are few things I love as much as wandering around a bookstore with a gift certificate in my purse! 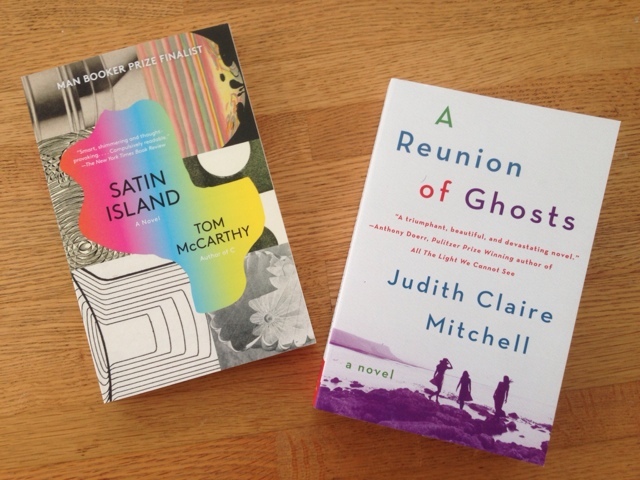 Satin Island is a very literary novel, the type that requires concentration and thought. A Reunion of Ghosts is the story of three Jewish sisters told against the history of the 20th century, and the author lives right here in Madison. Thank you so much, Bridget. These are the dog days of winter (if there can be such a thing), and your sweet gift means so much to me. You are an awesome blog friend and I love following your life. Now my only problem is deciding which to read first.